« What Will You do to Celebrate “Cost of Government Day”? Wow. Not even a pretense of caring about fiscal responsibility. Keep the status quo, even if it means America is doomed to suffer a Greek-style budget meltdown. Those were my thoughts when I heard that Harry Reid appointed Senators Kerry, Murray, and Baucus to the “super committee” created by the debt limit bill. And then I was similarly stunned when Nancy Pelosi picked Representatives Clyburn, Becerra, and Van Hollen. If you wanted to select the six most doctrinaire statists in Congress, you’d be hard pressed to come up with a different list. To understand just how left wing they are, here’s a chart showing their 2010 ratings from the National Taxpayers Union. They all had the same grade – a big fat F. And that is rather remarkable since NTU grades on a big curve. A score of 19 is all it takes to get a D.
For purposes of comparison, I’ve also added a line indicating Senator Ted Kennedy’s lifetime rating. He got an F, of course, but his average rating was higher than every single one of the big-government clowns named by Reid and Pelosi. As I said earlier, wow. I hope the too-eager-to-please GOPers realize that this super committee is nothing other than a tax increase trap. 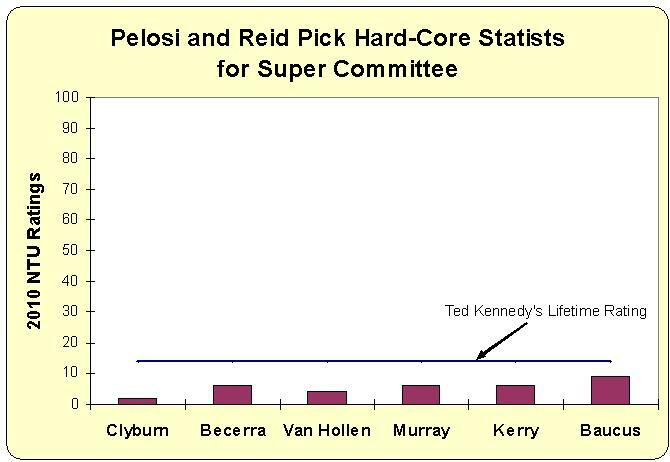 Fortunately, there is a sure-fire winning strategy for the super committee, which I’ll write about next week. Why aren’t unemployment benefits reduced over time? If you’re unemployed, you should – in addition to trying to find a job – reduce your expenses. Say, for the first 4 weeks, full benefits, but then reduce them each week by 1 or 2% of the initial benefit. To spur entrepreneurship, we could allow recipients to collect their next N weeks of benefits as a one-time lump sum to start a new very small business. That will not be enough, since Europe seems to be pulling ahead of the United States in the race to western decline. I mean, what crazy world do we live in? Some are even saying that if you try to force productive people to work not for themselves and their families but for some distant, presumably needy and/or indolent unknowns, while at the same time you encourage indolence by shielding the less productive from the consequences of lifetime mediocrity then… get this…you get less production? Who could have possibly imagined that? You mean there’s no Hope of Change to a free lunch enabling political machinery of economic coercion and macro-economic manipulation? You mean the Average American cannot Hope to 6x average world prosperity without 6x value in production? I can’t believe that! I’ll do anything, but that is the last reality I’ll accept. I’d better give irreversible American-Europeanization another chance in 2012 and another kick below the belt to American exceptionalism. I mean, free lunches would be such a breakthrough that I must first exhaust all possibility of success before I give up. Then, if it all fails, I can reverse course, can’t I? I can vote to set things back to the original American values of self-determination and self-reliance and I’ll be back on my way to reclaiming my 6x world average prosperity level as a middle class American — can’t I ? Thank heavens, the 3 Billion people that are part of the Developing World (China, India, Brazil, Turkey, Russia etc.) seem to be slowing down to a 7% growth rate this year, so Europeans and Americans can now be optimistic that this year they will only loose 6% of their prosperity advantage — which they had hoped would last forever. Finally, the American voter moth has seen the light… and like many moths before him, speaking various European languages, he will fly to it. Americans should pay attention to France because that is where the US is headed. Actually, the terminal state I see is more akin to Spain or Portugal because the Average American under French incentives to produce will not be able to match even the French—but, I admit, no one makes friends amongst an American audience saying such things, so do not expect any politician to bring up the issue. Besides, a centrally planned uniform and homogenized educational system may finally be able to educate the Average American to the same, rather competent but inefficiently uniform and homogenized French level. So perhaps France is an ok level to set the bar. All these tribulations through a couple of decades of HopeNChange to end up like France, and by then France economically near extinct after 20 years of 1% growth – with America in the same irreversible terminal state. Great job American voter! Quite the ride from where you once were!